Durst was an Italian company and (according to their own literature) the largest manufacturer of enlargers in the world. Dursts were well regarded but expensive in the USA compared to their domestic counterparts. But while many enlargers are variations on a theme, Dursts were very often innovative and did not look like anything else on the market at the time. M305 1981 35mm 15-3/4 x 15-3/4 Condenser No $359 Built-in supplimentary filters add 60CC Y and M on colorhead. Reviewed in Modern Photography magazine, April 1974. Era: It's nearly impossible to get actual production year spans; I've provided this simply to give an idea of when an enlarger was in production. Bellows means that the lens stage is connected to bellows that expand and collapse, and the bellows are typically moved via a wheel using friction (as opposed to using rack & pinion gears). Helical focusing means a collar around the lens is turned, and the lens housing is threaded so that the lens moves up and down. Rack & Pinion means that the lens stage moves up and down via a knob that turns gears. Tube means that the lens is set into a tube that moves up and down (as opposed to bellows). Autofocus: not to be confused with what we think of as autofocus today; these enlargers don't focus themselves. What they do is offer a sort of tracking control so that once the image is focused, it stays in focus as you change the elevation of the head for cropping. Column: all columns are assumed to be vertical unless oblique is noted. Oblique columns (i.e. angled forward) are nice at higher head elevations because the image won't expand back across the column post when the head is at the top of the post. On smaller enlargers this wouldn't be a problem, but at larger magnifications (and with lenses with shorter focal lengths), this can become a concern. The following review appeared in the now-defunct Modern Photography magazine, December 1959, in the "Modern Tests" section. It was written by Myron A. Matzkin. I've edited it slightly for brevity. Specifications: Durst Model 606 enlarger. Negative size: 8mm to 2¼ x 2¼. Focusing: Helical. Light Source: 150-watt Opal or projection lamp. Construction: Die-cast metal. Negative carrier: glass. Other features: Reflex focusing and viewing for copying; 35mm negative roll cups; lamp height adjustment; built-in red safelight filter; distortion correction. Price: $99.50 w/o lens. We quickly discovered an additional advantage to the carrier in making odd-shaped prints -- slim verticals and long, thin horizontals, for instance. Ordinarily, you may push the	enlarger lamp housing to the top of the column, spilling unwanted picture area off the easel. Unlock a red locking bar, lift out the mirror-condenser housing, turn it around and drop it back in place and the condenser becomes a viewing screen for the reflex system. The mirror reflects the image from the lens to the condenser, giving an exact picture of the copy. A ground glass screen in a special accessory carrier replaces the regular negative carrier and shows the area covered by the lens. A plate holder slips under the ground glass when you're ready to shoot. Exposure is controlled by the duration of the copying lights. The short column of the enlarger, only 28½ in. high, is a blessing for anyone working in a darkroom with a low ceiling. Even with its short height, you can make 16x16 prints from 2¼ negatives with the enlarger in normal position. Or you can tilt the lamp housing 90° and project on a wall for mural size prints. The tilting feature can of course also be used to correct perspective. You've got to be careful not to touch the removable lamp housing during prolonged exposures. While the rest of the enlarger tends to be rather cool, the lamp house does heat up considerably -- enough to burn your fingers, we found. The friction drive raising and lowering the enlarger operates with a knurled wheel and works rather slowly -- but smoothly. Illumination is even over the entire area of the baseboard. But if illumination should become uneven for any reason, adjusting the lamp height helps correct the situation. The following unsigned review appeared in the now-defunct Modern Photography magazine, April 1974, in the "Modern Tests" section. Manufacturer's Specifications: Durst M301 Enlarger. Features: Accepts 35mm negatives, No. 211, 75-watt enlarging lamp, condenser illumination, 18 in. upright, 14 x 14 in. baseboard, filter drawer, crank-operated lamphouse. Price: $74.95. Durst CLS 35 color head. Features: Stepless dichroic filtration with 0-90 calibrations in cyan, magenta and yellow, accepts 80-watt, 30-volt, quartz iodine lamp (GE EKP or equivalent), slide-in power supply. Price: $109.95. The color print market is booming. Color papers are proliferating, and more color equipment and technology has been marketed in the past five years than black and white. It's all in answer to the demand for good color prints that can be made rapidly in an amateur darkroom. Up to now, there were two kinds of enlargers that were available: the B&W enlarger that sported a filter drawer and the big, heavy, expensive professional machine that had a true color head with dial-in filters. There was nothing in between. Well, that's changed now. Durst has taken the simple straightforward M301 Enlarger and done an unheard-of thing. They have designed a small, low-cost, sophisticated color head to fit it. It has non-fade dichroic filtration, a feature previously found only in the most expensive machines. The new color head is called the Durst CLS 35. Put the M301 and the CLS 35 together and they spell good color prints. Let's take a closer look. The Durst 301 is a small enlarger, ideal for apartment or stow-away use. It's inexpensive and follows traditional Durst design, using a condenser combined with a reflex illumination system. It incorporates a 75-watt (No. 211) lamp and has no conventional negative carrier. Instead, the lamphouse is lifted by means of a lever, the negative is inserted and the lamphouse lowered The enlarger is driven up and down the column by means of a crank on the left-hand side of the housing controlling a large, smooth and positive friction knob. You can adjust the lamp by pushing up and down on the socket and it stays in place by means of a friction mechanism. This means you can make exposures as long as you want; heat is no problem. Alignment tests were also well within tolerances. Alignment between negative and lens, for example, was 1/4 bubble length, and about 1/2 bubble length between negative and baseboard, on our Omega alignment level. Now let's convert the M301 to an M301/CLS 35. First you slip off the front end of the lamp-house. Then take the cap off the 211 lamp, unscrew it and remove the socket. Finally, slide the CLS 35 into place and cover the bottom hole with a cap. That's it. Even working slowly and deliberately, it was hard to make the process take more than 3 min. Now let's make some color prints. A large power supply knocks the voltage down to 30 volts for the quartz iodine lamp. Hit the switch and the dials light up. They are arranged in a triangular pattern with the magenta being upper center, the yellow lower left and the cyan lower right Markings are clear and legible, from 0-90 in steps of five units. As each control is turned, a cam allows the selected filter to be lowered into the light in the same manner as the big Durst 401 color head. This is a scaled-down version of the bigger unit. Since color-reciprocity failure sets in after a 60-sec printing exposure, extending the measurements to 5 min. is totally academic. The point is that even with the greater temperature-rise characteristic of Quartz-iodine lamps, temperatures remain the same and no danger to the negative will result. Printing times were somewhat long, however. Our test negative required 40Y + 40M + 2B filtration to make an 8x10 print on Kodak Ektacolor paper with CP-5 chemistry. The exposure required was a rather lengthy 55 sec at f/8. We suggest that every care be taken not to produce overly dense negatives if this enlarger is to be used. Keep your camera exposures right on the button and be careful about processing times as well, or reciprocity printing limits may well be exceeded, resulting in off-color prints. Nevertheless, the Durst M301 plus the CLS 35 color head represents an ideal answer for the darkroom worker requiring a capable, low-cost color enlarger. It is not a substitute for the big professional color machine, but it certainly brings a high level of sophistication to amateur color printing at a reasonable cost. We hope it's just the beginning of a new trend. The following unsigned review appeared in Modern Photography magazine, February 1968. Specifications: Durst M-600 enlarger. Negative Size: Minox through 2¼ X 2¼. Focusing: Manual, metal bellows, rack and pinion. Light Source: Up to 150-watt opal lamp. Construction: Die-cast metal. Optical System: Double condenser. Other Features: Lamphouse tilts 15° for perspective control and 90° for wall projection, entire assembly rotates 180° for floor projection, glass negative carrier with continuous mask, color filter drawer above negative stage, focusing aid system, baseboard measures 15½ X 19½", maximum magnification (on baseboard) with 50mm lens is about 13X, with 75mm lens about 8X. Price: $99.95 without lens. The Durst M-600 is truly a portable enlarger--it can be assembled or disassembled in just a few minutes. When put together it resembles a piece of sculpture right out of New York's Museum of Modern Art. Fortunately, it not only looks pleasing but it also functions as an enlarger. The M-600 has a universal glass negative carrier with a built-in four-way adjustable mask to eliminate unwanted image area and extraneous light (which can cause paper fog). Its single negative carrier is used for all negative sizes from Minox to 2¼ X 2¼ -- a saving of quite a few hard-earned dollars compared to enlargers which require a separate carrier for each negative format. Incidentally, the adjustable mask is one professional feature of the M-600 which is lacking on more expensive enlargers designed for the professional. The glass carrier has only one side--a bottom. You lay the negative (emulsion side down) on the carrier, then lift the M-600's spring-loaded condensers by raising a bar. Then you slip the carrier in the enlarger and lower the condenser. The condenser becomes the top of the carrier and holds the negative flat in place. This Durst enlarger sports a focusing aid. Here's how it works. You pull the negative carrier out half way (which disrupts the negative position and can scratch the negative unless you're extremely careful). We found it better to remove the negative entirely before pulling the carrier out. Then you turn a knob on the left side of the circular, spring-loaded, metal lens board. This places a half red, half green filter above the lens. You look down on the easel and you see three small squares. Now you turn the focusing knob on the right side of the enlarger. When the squares are out of focus they take on a green and red color. When in focus the colors seem to disappear. Next you return the negative and carrier to its original position. 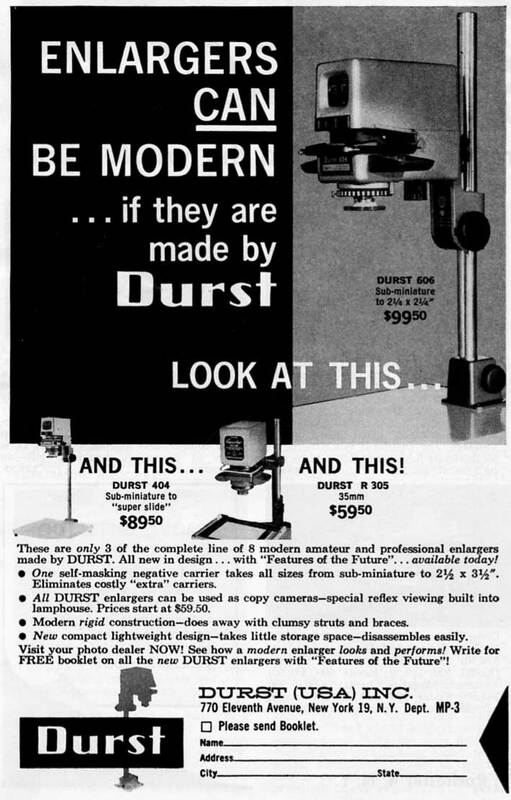 Now, the Durst people say the enlarger is focused. Our tests indicate the projected negative image to be almost in focus. So we focused manually and kept on focusing that way. Our lab tests indicate good evenness of illumination with both lenses tested--the 50mm f/4.5 Schneider Componar and 75mm f/4.5. Both lenses performed quite well wide open at f/4.5, showing slight sharpness fall-off at the edges. But who prints with a lens wide open? At f/8 sharpness proved very good--almost indistinguishable from similar tests previously made with the higher priced Componon. Construction of the M-600 is A1. Its reflex condenser system makes for a lower profile. Thus the machine is better balanced than many of its "high silhouette" competitors. This makes it less apt to vibrate during long exposures. Result: sharper prints. Adjusting lamphouse height is done by turning a large crank. To raise it for increased magnification you crank clockwise. To lower it you crank counterclockwise. It goes up and down smoothly and stays where you want it without having to lock it in place. The Durst M-600 is available without lens (in case you already own one) or with Isco, Schneider, and Nikkor lenses. Price depends on the optic. It's also available as a complete darkroom developing and enlarging kit, with trays, developing tank, chemicals, etc. With 75mm Isco lens, price of the kit is $149.95. It costs $169.95 with 75mm Schneider Componar. The following unsigned review appeared in Modern Photography magazine, November 1980. It's been edited slightly for brevity. Specifications: Durst M 605 Color Enlarger; accepts all negative sizes to 6 x 6 cm (2¼ x 2¼"), 33" column, counter-balanced gear-driven head, friction-driven focusing. Dichroic color head has built-in 35mm and 6x6 mixing boxes with lever selection, tungsten-halogen 12-volt, 100-watt AL-231 lamp, cyan, magenta, and yellow filtration 0-130 calibrated in single units 0-10 and in units of two from 10-130, Illuminated color-coded dials, supplementary built-in filter supplying an extra 20M and 40Y, white light lever, interchangeable lens-boards, negative carrier has built-in masks and interchangeable inserts from 12 x 17mm to 6 x 6 cm; condenser head has interchangeable 35mm and 6x6 condensers, 150-watt opal lamp, maximum enlargement on baseboard with 50mm or 80mm lens 12 x 16" or 20 x 24" with accessory extension arm. Other Features: red filter, filter drawer in condenser head, column calibrated in inches, millimeters, and magnification (for both 50mm and 80mm lenses), lensboard tilts to 30° and shifts laterally 20°, head tilts through 90*. Price: $995 with dichroic head; condenser head $225. Durst builds enlargers to a specific design philosophy which has remained essentially unchanged for the last 20 years or more. Small Durst enlargers tend to be scaled-down versions of big Durst enlargers. What they all have in common is the massive ruggedness that results from using heavy castings where lesser machines use sheet metal stampings, broad, reinforced uprights where others use light tubing, and precise alignment where many others may opt for an approximation of precision. The Durst M605 color enlarger is made in this tradition of ruggedness and precise alignment, but with some important new innovations that we might see as industry standards in the years to come. The total assembly consists of three major steps and a few minor ones. Remove the baseboard, upright and head assembly from the carton, and bolt the head assembly to the baseboard using the wrench supplied. Remove the color head, slip it into place on the housing, tighten the two bolts and the M605 is assembled. A word of caution--no one should ever think of using a color head without a voltage stabilizer. Durst recommends the Vivek Model 90. It produces a regulated 100 volts from inputs of 105-109 volts. While this both regulates the output of the Durst's EFP lamp and increases its life, it does extend exposure times. Substituting a regulator producing 115 volts increased our printing speed by more than a stop. Either regulator works fine, but think how fast a machine you want before you make your selection. The head moves smoothly up and down the column by means of a counter-balanced gear-driven rack-and-pinion action. Although the head cannot be locked in position, its action is so solid that no lock is needed. This enlarger is right-handed when it comes to elevation or focusing controls. Focusing is by means of a 1½" knurled knob, with a full 6" of bellows available to make reductions easy for both 35mm and 2¼ negatives. The entire focusing design is commendable. Two steel rods hold the unit solidly and in good alignment, and probably will through a lifetime of hard use. Its friction drive design is silky smooth and solid as a rock at the same time. Like to change the tension on the focusing drive? No problem, just change the tension on the set screw just behind and below the focusing knob. The Sirioneg negative carrier is in keeping with the Durst "do everything" philosophy. It does, indeed, do everything. It's a book-type unit, hinged at the rear. It comes with optical glass flats which can easily be interchanged with glassless inserts, each of which has its own strange and picturesque designation (6x6 cm code Sivopar 66, 4.5 x 6 cm code Sivopar 45, 24 x 36mm code Sivopar 35, 26 x 26mm code Sivopar 26, 18 x 24mm code Sivopar 18, and 12 x 17mm code Sivopar 17K), and finally a mask that holds 2x2 cardboard-mounted slides, code SIDIA. The Sirioneg also has built-in masks on all four sides to block off unused parts of the negative, getting rid if unwanted light. A set of adjustable film stops accurately positions negative strips. Push 'em back for 2¼, pull 'em forward for 35mm. Nice and neat. When you want to go from one negative to another on the same strip, just open the carrier while it's in the enlarger and it will lock open. Position your next negative, then push the tab at the top right of the carrier and the carrier will snap shut. Very convenient. The newly designed color head is as innovative as the chassis is straightforward. For example, it is the only color head with both 35mm and 2¼" mixing boxes built-in--selected by a lever on the right side of the lamphouse. Pull it forward and the 35mm box is in position. Push it back and the 2¼ box snaps into place. It's incredibly fast. Hopefully, someday all enlargers will be built this way. In addition, at the front of the lamphouse, a switch allows the addition of a "B" filter having a value of 40 yellow + 20 magenta (which you can think of as 20 red + 20 yellow if that's more convenient). This extends the range beyond the maximum of 130 available in the color head should that ever become necessary. A white-light lever to the left side of the lamphouse throws the filters out of the light path. A red pilot light at the front of the lamphouse indicates "white light" mode. The arrangement of filter controls is a bit unconventional and takes some getting used to. The cyan control is at the left side of the lamphouse, yellow at the upper right and magenta at the lower right. At first, this caused a lot of fumbling and searching. However, after a few prints, one only has to remember that the yellow is at the upper right. Since the cyan is rarely used, that leaves the magenta below the yellow. Once you've got that straight, it all becomes simple, though a bit unorthodox. The filters are calibrated in single units from 0-10 and in units of two from 10 to 130. The dials are brightly illuminated and easy to read in the dark. Actually, they're darn near blinding. In addition, a small light leak coming from the lower part of the filter dials hit the ceiling with a splash of white light. We added a cloth flap to insure light integrity of the head. This easily-corrected light leak was, fortunately, the only flaw we detected in the color head. The Durst filter system is different from the standard CC system used by other enlarger manufacturers. It goes something like this: 50 CC units is equal to 30 Durst units. 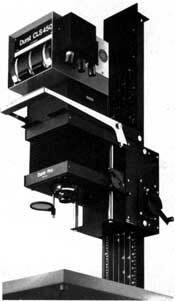 That means that the 130-unit range of the Durst enlarger equals 215 CC units--a very broad range, indeed. In our experience, we've rarely come across a negative that required more. But if you do, remember that "B" filter. Laterally, the alignment between negative and baseboard was perfect, but both were out by less than ¼ bubble length error in relation to the lens. Outstanding! Longitudinally, the negative carrier, baseboard and lens indicated no discernible misalignment. Now for illumination checks. We check two ways: corner-to-corner and corner-to-center. In the corner-to-corner tests un-evenness of illumination was less that 1/10 stop and corner-to-center less than ¼ stop. This performance held consistent for both the 2¼ and 35mm mixing boxes and must be considered among the best we have ever tested. Temperature tests at the negative with the condenser head proved to be quite satisfactory as the Durst reflex illumination system acts as a heat trap. With temperatures at the negative never going over 76°F, there is absolutely no chance of buckling or other heat damage to the negative. Color prints from the Durst M605 are different, and it's immediately evident that there's something special about this color head. To begin with, the reds are highly saturated and extremely rich. Colors are clean and brilliant. Overall print quality is a delight. We attributed this to superior infrared filtration, but Durst says not so. They've designed a new magenta filter that they credit with the higher performance. Well, whichever it is, on this basis alone we'd unreservedly recommend the Durst M605 as one of the best machines for hign quality color printing. For B&W printing, unscrew those two retaining screws and replace the color head with the Siriokit BW condenser head. It is classic Durst, with its mirror reflex systems illuminated by a 150-watt tungsten lamp. The 35mm and 2¼ condenser are easily interchanged by screws. With the lens stopped down to f/11, the exposure time is a mere 6 sec. for an 11 x 14 print on Kodak Polycontrast Rapid paper (no filtration). Evenness of illumination was typical for condenser units —-½ stop between corner and edges and about ¼ stop corner-to-corner, which is within tolerance. The M605 will produce 12 x 16 prints on the baseboard (which measures 19½ x 21½ x 1¼) from either 35mm or 2¼ negatives using the appropriate lens. However, Durst provides an extension arm that raises the head an additional 8½", allowing 16 x 20 prints from 35mm and 20 x 24 prints from 2¼ negatives. It's an accessory we highly recommend for anyone making large prints. The extension arm is so massive that alignment is undisturbed. Europeans are quite fond of using their enlargers to correct linear distortion, such as taking a building that is "leaning back" and using negative and lens swings to bring its lines back to vertical. And since the Durst M605 is a good European machine, it has all of these niceties built-in. For example, the head can be swung 45° each side of center while the lens can be shifted 20mm each side of center and swung 30° each way. Sort of like a little view camera. The $995 price tag is hefty,; but considering the performance, it's worth every penny. The Durst M605 is a class act, and class costs.